One of my favourite parts of the job – hearing how your baby’s birth went for you, and how you and your partner used the techniques! Read more on my Facebook page. When we arrived the midwife was convinced she would be sending us straight home as my behaviour did not suggest I was in labour, but when she examined me at 10.30am I was 3 cm dilated. I chose to go for a walk with my husband as it was a gorgeous morning – kind of an odd walk as I was like a clockwork toy, only getting 50 yards between each surge where I would stop and concentrate on my breathing! I felt really strong and confident while I was giving birth. I felt great and still do; I had a birth which was a wonderful experience for all three of us, with no need at all for pain relief, that happened very quickly and comfortably, and only leaves memories that we will always look on very fondly. The fact that we have immediately settled in as a family, and our baby is so calm and happy I put down to the experience we had. I will be recommending HypnoBirthing and your fantastic teaching of it to absolutely everyone who will listen! The breathing exercises were so helpful, and the midwife in triage wasn’t going to examine me because she decided that I wasn’t very far along because of the way I was handling my contractions. H has been a superstar at feeding, he has gained weight really well and is generally a happy baby. We really appreciate everything we learned at HypnoBirthing. Thanks so much for everything! The breathing exercises definitely helped me through the night, and I wish you could have seen the doctors face when he found I was 8cm and had at that point only had co-codamol! I just wanted to thank you for recommending HypnoBirthing to us… I really couldn’t have asked for a better experience. I was so relaxed through the surges that the midwives couldn’t tell that I was in active labour. Without me consciously doing anything, the birth was a complete relaxed happy blur until I thought ‘Ouch’ a little bit as he came out… although even that was more of a satisfied ‘ahhhhh’! 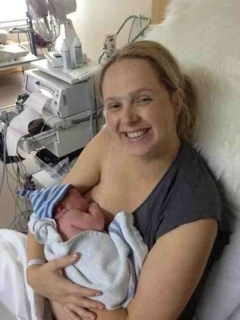 HypnoBirthing was extremely helpful as it kept me sooo much calmer than I would have been while in hospital. I was able to meditate, use the TENS machine and relax while the surges started…. the midwives couldn’t believe how calm my husband and I were and how well I was handling the surges. We are at home now and J is amazing. She is a fairly calm baby and only cries when something is wrong – she has a great pair of lungs! Although this wasn’t a typical HypnoBirth I still found all the techniques very useful and highly recommend the course! I gave birth to my beautiful daughter…. it was a completely natural delivery. When I called the midwife out we were both shocked when she examined me for the first time and said I was 9cm dilated. She was amazed at how calm I was and said she felt like she had come to watch how a labour should be done. Just wanted to thank you for the classes, I would highly recommend them.